ETFE is a fluorine based plastic, and could be described as a tough high strength version of PTFE. It has excellent chemical, electrical and high energy radiation resistance and a relatively high melting temperature. 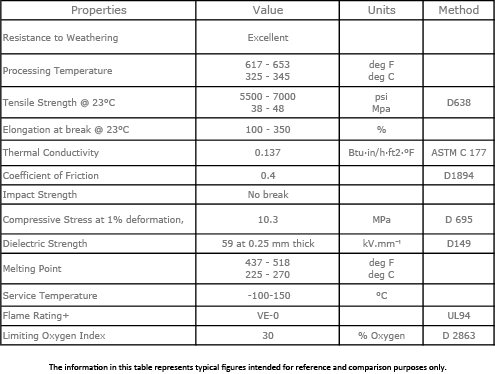 Properties such as chemical inertness, outstanding weathering & heat resistance, excellent electrical insulation and low coefficient of friction enable ETFE to be exploited in a diverse range of applications such as football stadium roofing, wire insulation, insulated transformers, and surface coatings. ETFE is less flexible than PTFE but has far superior abrasion resistance. ETFE is a thermoplastic and can be injection moulded into very thin components or hot compression molded into stock shapes such as Rod, Tube or Sheet. Our FL300 material is commonly used in the production of Cathode Distance Strips. ETFE is also used in the Aerospace industry, covering wire in high stress, low fume toxicity, and high-reliability situations along with the nuclear industry for tie or cable wraps.